I recently wrote about my reading struggles (HERE). I’ve been in a bit of a slump and haven’t been that excited about reading. But, it’s a new month and I’m planning to actually schedule reading into my day to see if that helps me work in more reading. I read 8 books last month, 4 of them being children’s books. I listened to my first audiobook and am hoping to do more of that. One book was written by a Cedar Rapids native for The Gazette and I am excited to share that book with you this month. I’m still being very careful about the books I chose to accept. I’m in the gift giving season and have bought some books to give as Christmas gifts. I’m hoping to buy more! Books make the best gifts! I’m only going to read books that I am interested in. If it isn’t working for me, I’m going to put it aside and move on to something else. I can’t read every book that comes my way, but I can at least share them with you here and I hope to review them just as soon as I can. clicking on the photo of the book will take you directly to Amazon. without you having to pay any more for your purchase. I appreciate your support of SincerelyStacie.com reviews. 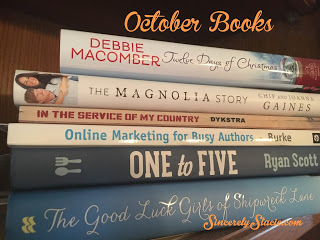 to share our stacks of books for October. as well as other bloggers’ Book Stacks, click HERE. I’ve have been a regular reviewer for FSB Associates for awhile now. So, I am excited to share their founder and president’s book with you. I don’t even intend to be an author, but my sister-in-law does, so I hope to share some of the insights from this book with her and of course, with you! I love this concept of taking one food item and making 5 different recipes with it. For example Pillsbury biscuit dough, that comes in the tube. Scott gives you 5 different ways to use that dough for a meal or side. He starts with everything from eggs to broccoli to pork shoulder to a cake mix and gives you 5 different recipes. The recipes are simple and use ingredients you probably already have in your fridge, pantry, or freezer. I can’t wait to try a few of these out. If you can’t prep it, cook it, and sit down to eat it in less than an hour, chef and television personality Ryan Scott doesn’t want to do it. It’s just that simple. ONE TO FIVE is cooking for real life: master one basic recipe and learn to spin it into five quick, affordable, and crowd-pleasing dishes. Discover how Ryan’s killer marinade, a simple rotisserie chicken, or an easy slow-cooker roast can turn into soul-satisfying meals like carnitas, stuffed egg rolls, sliders, a Vietnamese salad, and a hearty stew. From taco night to breakfast as dinner, this book is all about flexibility as Ryan invites home cooks to think creatively about cooking while using supermarket staples. He offers ingenious strategies, tricks, and guidance on stocking the freezer and pantry so that great-tasting meals are always ready at the drop of a hat. ONE TO FIVE makes cooking so simple that readers can eat a delicious home-cooked meal without the hassle – and have fun while making it. I believe this was a Kindle First choice, but I’m not quite sure. It intrigued me and is one I will definitely want to read over the winter. Nina’s graduate program at Moscow University isn’t exactly cheap. So when she is offered work translating for Spanish families looking to adopt orphans from the provincial town of Rogozhin, she quickly agrees. Besides the much-needed money it brings, the job is a great opportunity for Nina to use her education to help people in hardship. But soon she finds that nothing is as it seems. By the time Nina realizes that all too often the business of international adoption is not a humanitarian enterprise, she’s in too deep. Will she be able to navigate a world of exploitation and political corruption in order to help the children? Or should she return to the much simpler world of academia and leave the orphans behind? WAKE IN WINTER is a captivating story of one woman’s choice in the face of a shattering discovery. I’ve already reviewed this book, HERE. 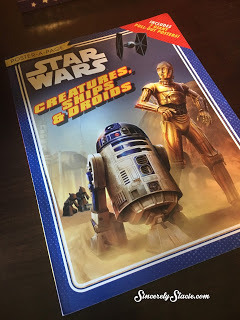 I gave this book to a little boy who had a 6th birthday and loves Star Wars. I think it would make a great Christmas gift for a Star Wars fan on your list. The creatures, ships, and droids of Star Wars are some of the most beloved and collected “characters” of the Skywalker Saga. Wookiees and Tusken Raiders; the Death Star and the Millennium Falcon; R2-D2 and B1 Battle Droids-all the fan favorites are represented in this new collection of posters featuring memorable quotes and moments, character galleries, fun facts, and much more from the first six Star Wars films. Every page is a poster in this full-color collection, plus fans get six additional supersized, fold-out posters, and one special color-in poster they can make all their own. The Poster-A-Page series offers kids the opportunity to bring their favorite friends and stories into their homes and onto their walls, and to become part of their world. This book came up as a daily Kindle deal and I had to snag it as an Iowa farm girl. My dad grew up on a dairy farm in NE Iowa and I’m sure he will be able to relate to a lot of the stories she shares. GROWING UP COUNTRY: Memories of an Iowa Farm Girl delivers a treat as delicious as oatmeal cookies hot out of the oven – a memoir of a happy childhood. In charming and memorable vignettes, Carol Bodensteiner captures rural life in middle America, in the middle of the 20th Century. Bodensteiner grew up on a family-owned dairy farm in the 1950s, a time when a family could make a good living on 180 acres. In these pages you can step back and relish a time simple but not easy, a time innocent yet challenging. If you grew up in rural America, these stories will trigger your memories and your senses, releasing a wealth of stories of your own. If the rural Midwest is foreign territory to you, Carol’s stories will invite you into a fascinating and disappearing world. 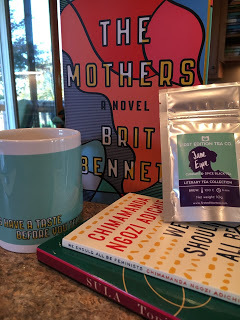 After getting to know Kelly Harms and reading her newest book, THE MATCHMAKERS OF MINNOW BAY, I wanted to read her debut novel. On a recent trip to Half-Price, I used some book credit and birthday coupon to get this book. To see my interview with Kelly and read my review of her newest book, click HERE. This year’s lucky winner of a brand-new dream home: Janine Brown of Cedar Falls, Iowa. For heartbroken Janine “Janey” Brown, this announcement has the hallmarks of one of her Aunt Midge’s harebrained plans to lure her from her tiny kitchen, where she’s been submerging her grief in the pursuit of the perfect pot-au-feu. Meanwhile, across town, Janine “Nean” Brown couldn’t be more thrilled. She just knows that this house is her destiny, the chance to escape the latest in her revolving door of crappy jobs and drunken boyfriends. When both Janine Browns descend on Christmas Cove, Maine, to claim the prize they both think is theirs, however, they discover that more than just a dream home awaits them at the water’s edge. Filled with wit and charm, THE GOOD LUCK GIRLS OF SHIPWRECK LANE is Kelly Harms’s enchanting and heartfelt debut–a testament to the many ways love finds us, the power of a home-cooked meal, and just what it means to be lucky. I purchased this book for my Secret Pal at church. Who doesn’t love a good Debbie Macomber Christmas story?!?! We are huge fans of Chip and Joanna at our house and was interested in reading their story. Our daughter read the first book in this series, THE HAUNTING OF SUNSHINE GIRL and declared it the “best book ever”. So, I purchased the sequel and she started reading it right away and has already finished it, with this one now being “the best book I ever read”. I couldn’t have read these types of books at her age or I would have had nightmares, but she seems to like them. Eager to get her supernatural abilities under control, Sunshine agrees to begin training with her mentor, her estranged father Aidan. He takes her to an abandoned compound deep in the Mexican jungle. But what she learns there about her powers and her family history, turns out to be more terrifying than Sunshine could have imagined. Can anything—Aidan’s experiments, her friendship with another luiseach named Lucio, even Nolan’s research—prepare Sunshine to face the frightening woman who haunts her dreams, and to finally learn the truth about the rift that threatens the future of the luiseach and all of the humankind? I shared the first book from the Churchman’s last month, HERE. 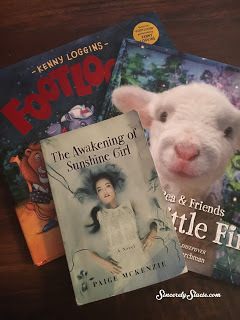 So, I had to get their next book with the adorable lamb on the cover. I’ll be giving this to my niece for Christmas. If you grew up in the 80’s like I did, then there is no doubt you were a fan of Kevin Bacon in “Footloose”. It is still one of my favorite movies today. So, when I saw there was a book for kids, I had to get it. I haven’t decided if I’ll keep it for myself or pass it on as a gift, but it is awesome. 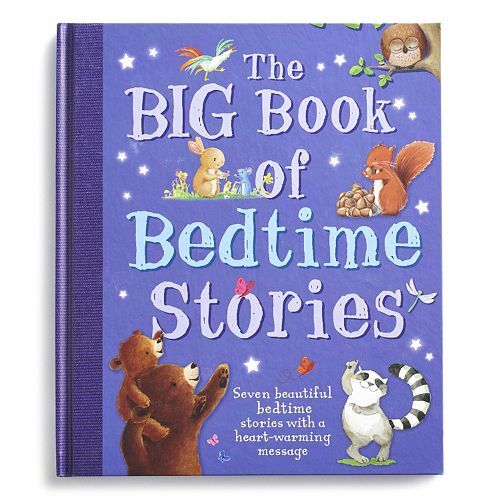 It would make a great storytime book for a preschool class! Time to cut loose! Have a rockin’ time introducing children to the fun of Footloose, rewritten for children by the one and only Kenny Loggins. As a zookeeper named Jack joins the zoo animals in an all-night dance party, this new original story from Loggins is sure to get your feet moving. Little ones will love the cast of characters, including the rockin’ chimp Louise (“Geez, Louise”), Mister DJ Elephant, the lemur Marie (“Oo Wee, Marie”), Milo the wombat, Luke the funkiest cat in the zoo, and so many more rocking, bopping, boogying, tangoing, shaking, rattling and rolling animals! 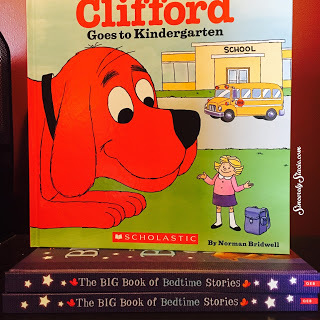 We loved reading Clifford books when the kids were little. They were big fans of the show and even met him once at a library storytime. Kohls Cares for Kids offers books for $5 and this is one of their selections. I snagged it to send off to my niece when she starts kindergarten. Emily Elizabeth is starting Kindergarten and she’s a little nervous. Good thing that the teacher sent a note home that says each child can bring something from home to make the transition a little easier. But the teacher didn’t bet on a child bringing something–or someone–as big as Clifford! This book is only available at Kohls. But for just $5 it is totally worth making the trip there to get a copy. I purchased two for Christmas gifts. 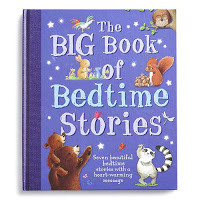 Heart-warming messages make this Kohl’s Cares Big Book of Bedtime Stories the perfect choice for helping your little one fall asleep. This book has been getting high praise since it’s debut and I was thrilled to get it in my Literary Box. I had almost purchased it at Half-Price books but chose the Kelly Harms book above. I’m anxious to read it. This book also came in the Literary Box from Quarterly. It’s quite short and even though it isn’t something I typically read, I’ll give it a look before I pass it on. What does “feminism” mean today? That is the question at the heart of We Should All Be Feminists, a personal, eloquently-argued essay—adapted from her much-viewed TEDx talk of the same name—by Chimamanda Ngozi Adichie, the award-winning author of Americanah and Half of a Yellow Sun. With humor and levity, here Adichie offers readers a unique definition of feminism for the twenty-first century—one rooted in inclusion and awareness. She shines a light not only on blatant discrimination but also the more insidious, institutional behaviors that marginalize women around the world, in order to help readers of all walks of life better understand the often masked realities of sexual politics. Throughout, she draws extensively on her own experiences—in the U.S., in her native Nigeria, and abroad—offering an artfully nuanced explanation of why the gender divide is harmful to women and men, alike. Argued in the same observant, witty and clever prose that has made Adichie a bestselling novelist, here is one remarkable author’s exploration of what it means to be a woman today—and an of-the-moment rallying cry for why we should all be feminists. This book also came in the Literary Box from Quarterly. I have never read a Toni Morrison book, but have heard amazing things about them. This book was given to me by my neighbor. 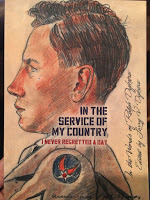 Her brother, Larry Dykstra wrote this book about their father’s time in WWII. I previously reviewed Dykstra’s book MUSICAL HUGS, HERE. This book isn’t available through Amazon, but I still wanted to share it with you. I love reading this time period and knowing that the stories are true will make it even more interesting. As always, if you read any of these books, be sure to let me know your thoughts. Happy Reading! Great haul. I've had Good Luck Girls of Shipwreck Island on my wish list for a while. It looks really good. Enjoy your books. I remember that I loved to read Stephen King books when I was a teen…the scarier, the better! The Christmas book looks so charming. I think I'm going to put lots of "cozy" Christmas books on reserve at the library and dive in during the month of December! Have a great week!